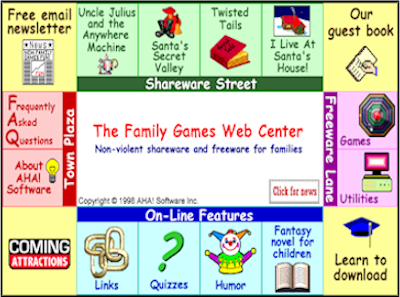 FamilyGames.com arrived on the Internet in 1995. Family Games began when Nick Sullivan of AHA! Software decided that what his sons needed was a good non-violent adventure game. Nick designed and programmed Santa’s Secret Valley, and Brigid Skelton supplied the art that brought it to life. At that time Chris Zamara was the other half of AHA! Software, and he and Kathy Zamara were instrumental in getting Family Games off the ground. Children in all three families provided much feedback and testing. 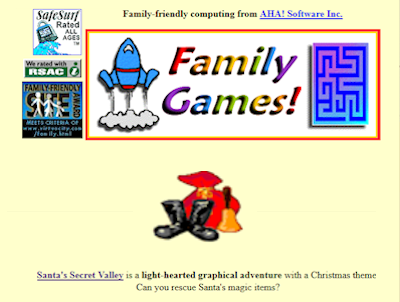 FamilyGames over the years, courtesy of the Wayback machine. 1996 — early days! Our first game was Santa’s Secret Valley. It’s still a Christmas tradition in many homes. By December 1998, Nick and Brigid had created three more games. Links to the pages on the site were presented as a game board. Family Games was one of many projects. When Chris left AHA! to join Pinnacle, Nick began to work on manuals for Pinnacle projects, especially Studio. Developing software to assist with translating the Studio manual and producing help files took much of his time. The creation of in-depth quizzes for our Trivia Park site was another major project. Through it all, he continued to create software for Family Games, notably NoteCard and World Geography Tutor. 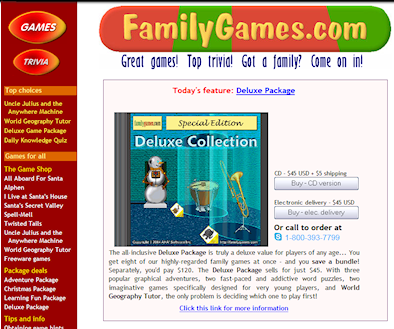 The 2005 edition featured a sidebar for navigation. The Deluxe Collection included all eight shareware games. 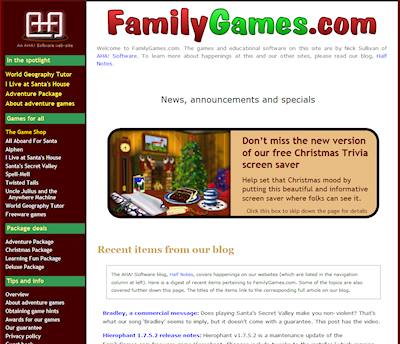 By 2012, our popular Christmas Quiz had moved to TriviaPark, and a Christmas Trivia screen-saver had been developed. 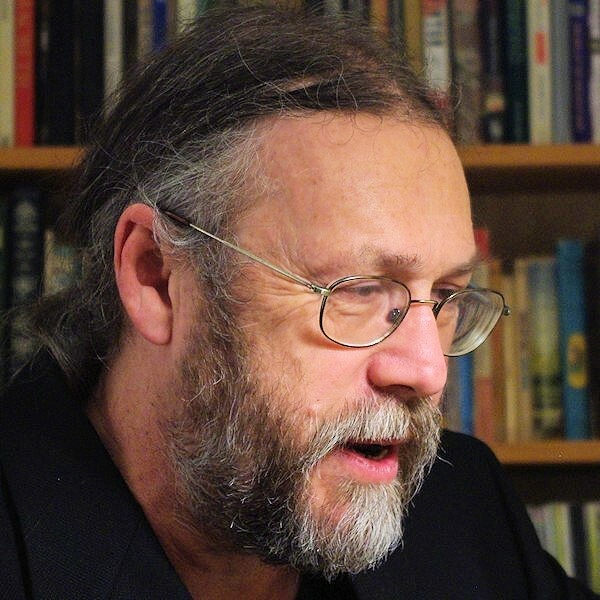 The creator of this website is Nick Sullivan, a Canadian writer, musician, editor, game inventor and software developer. Nick is a published author with two books to his credit, and a software developer with some 20 extant products. For many years he had the principal responsibility for the design, writing, editing, maintenance and localization of the respected user manuals for the Pinnacle Studio video editing software. He is also the principal author and maintainer of a number of active websites besides Family Games, including Ahead With Music and Trivia Park. More recent projects include Walt’s Band, where you can hear Nick’s original songs, and AHA! Text Services, where we are ready to help with any of your textual needs. The other participant in AHA! Software and its modest archipelago of software products and websites is Nick’s wife Susan M. Scott, who has contributed indispensably though without fanfare to many AHA! projects. 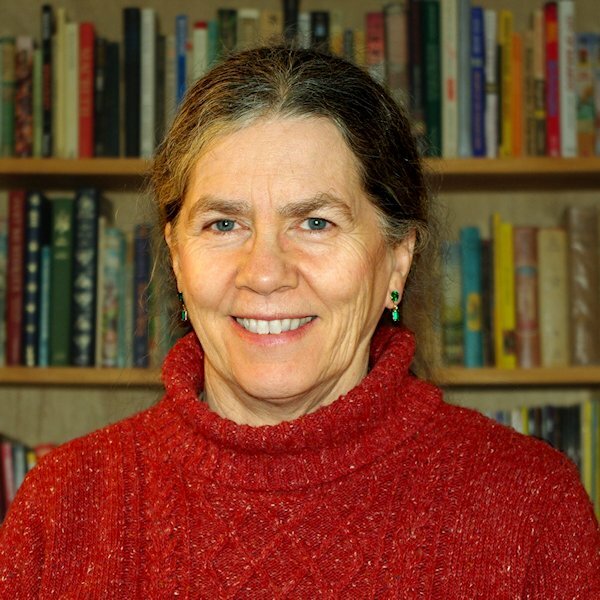 Susan is one of the few people you are likely to meet who has a joint Honors degree in mathematics and anthropology, so it’s perhaps not surprising to learn that her interests are wide-ranging. With her well-honed writing, editing and design skills, she is now moving into a more visible role as a core member of AHA! Text Services, a brand that embodies the company’s recent initiative to bring its long-standing sidelines in software manuals and other advanced text services to a wider audience.